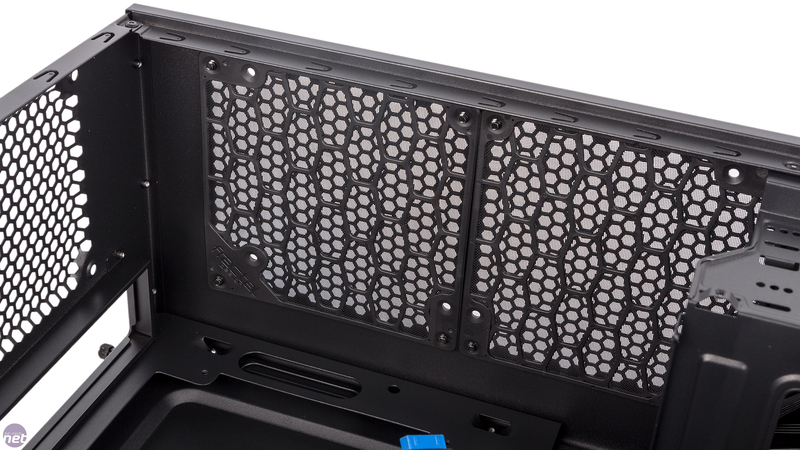 The side panels actually use a front-hinged designed rather than the traditional notches and rails, and we're happy to see this in a budget case, as the latter method is often stiff and fussy. Like the outside, the internals of the Focus G Mini are not especially exciting, but at this price it's more important that they're functional rather than revolutionary. 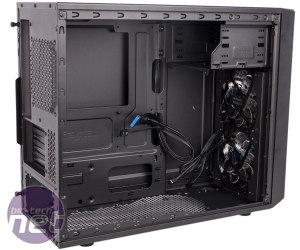 It's a standard tower layout, although the lack of a mid-plate shielding the PSU from view and the presence of the ODD cage means there's a sense of yesteryear to it. 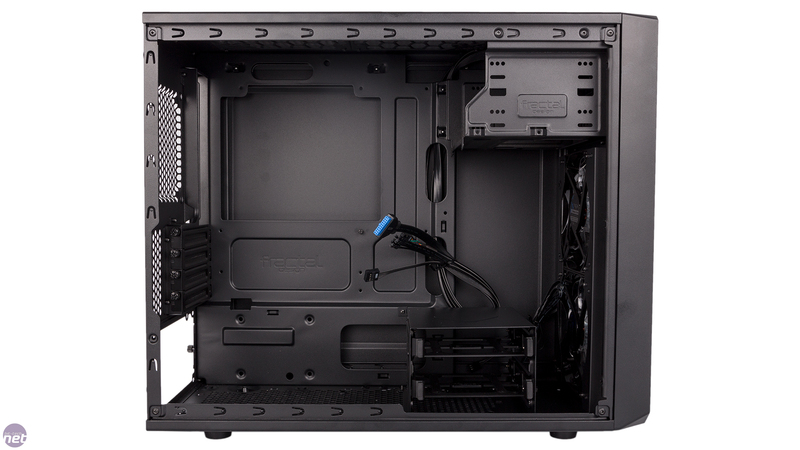 Each piece of core hardware is easy to install, as the Focus G Mini is spacious and consequently has lots of clearance. 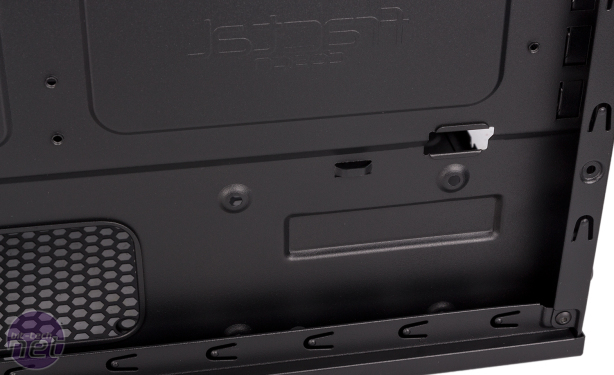 There are small bits of rubber for the PSU to rest on to help isolate it from the chassis too. 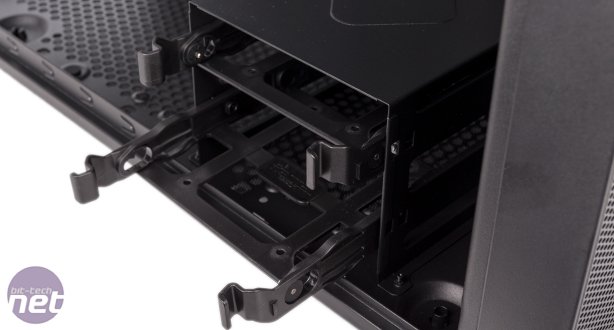 The two-bay HDD cage installed towards the lower-front corner supports both 3.5” and 2.5” drives on its plastic trays, which are definitely on the flimsy side. 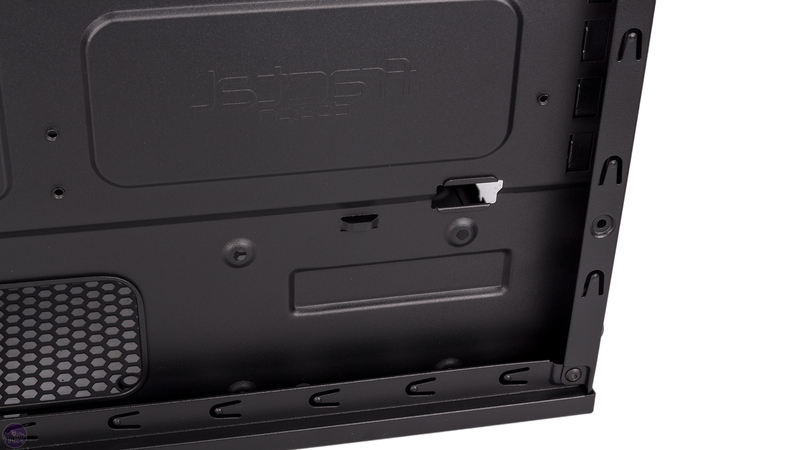 You don't need tools to install the larger drives – just bend the tray around the drive and the mounting pins will lock it in place. These pins have little bits of rubber around them as well. 2.5” drives, meanwhile, are installed with good ol' fashioned screws. Having 2.5” drives installed behind the motherboard tray is common, but Fractal's implementation is poor. 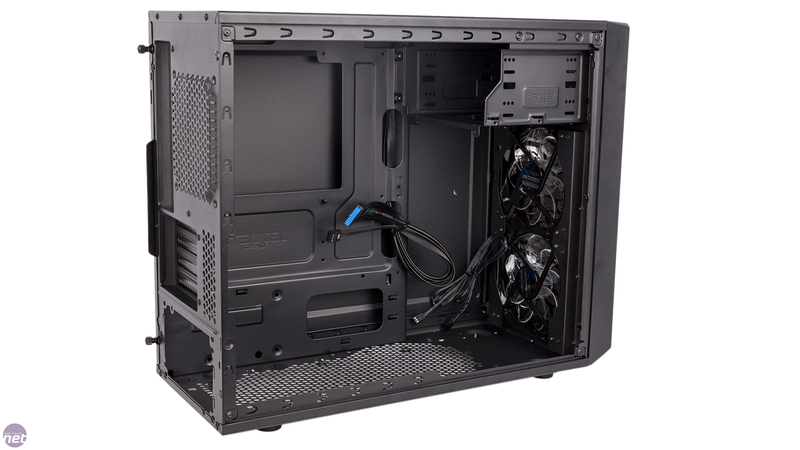 It only has a single mount for starters, but the main issue is that it is installed directly behind the PSU and needs to be screwed directly into place rather than onto a removable tray. This means you have to install it before your PSU and that if you want to remove or replace it for any reason, you'll need to remove your PSU first – hardly convenient. 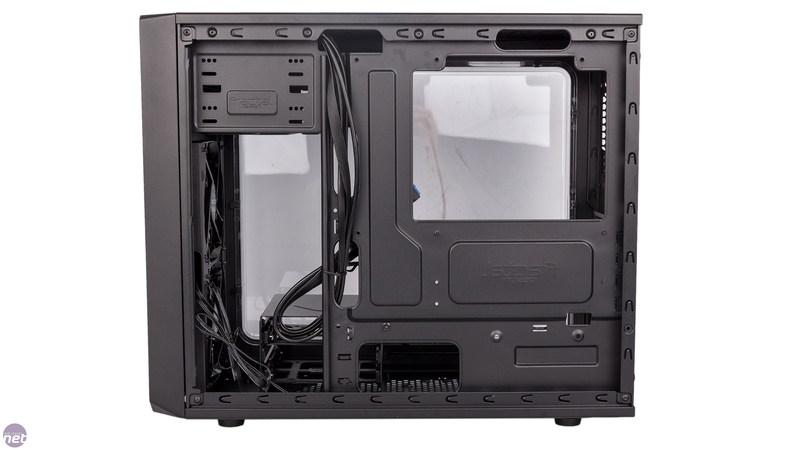 All of the internal cables are sleeved in black, which will help stop them standing out through the window. 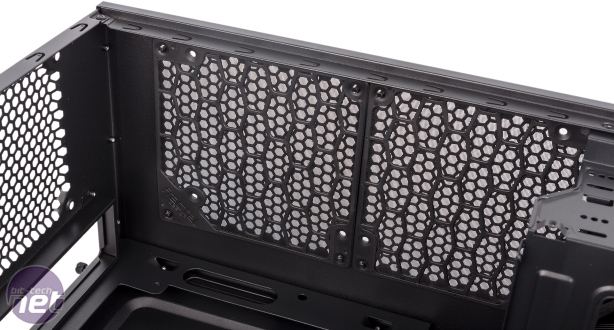 There are a good few options for cable routing, including a large cutout next to where your PSU cables will be, a series of holes above and to the side of the motherboard, and even the CPU cooler cutout – this is large enough that the edge of it can be used to feed cables through to mini-ITX motherboards like ours. 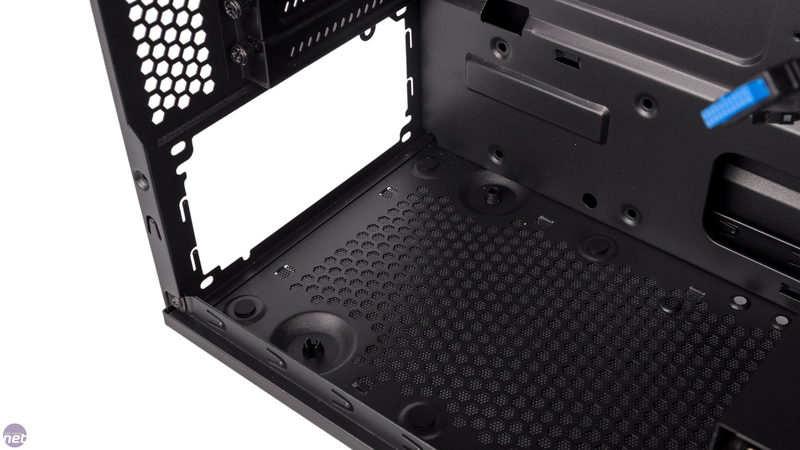 There are no rubber grommets on the holes, however, and the motherboard tray does not extend all the way to the front. 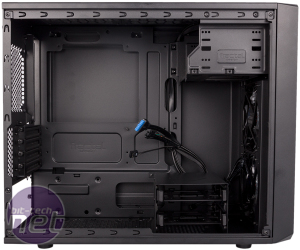 Also, space behind the motherboard tray is limited, but the extrusion on the side panel somewhat makes up for it, as does the indented cable channel. 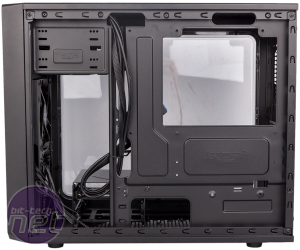 Water-cooling is understandably not a focus for a case like this, but nevertheless the Focus G Mini does have some decent options here, with 240mm radiators supported in both the front and roof mounting positions, limited to 45mm and 35mm thickness respectively. 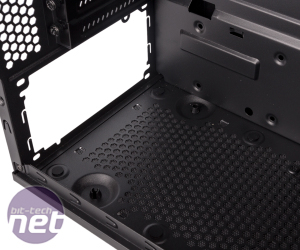 The front position also needs the lower optical drive bay to be unoccupied; there's a cutout in the cage to allow the radiator to poke through. 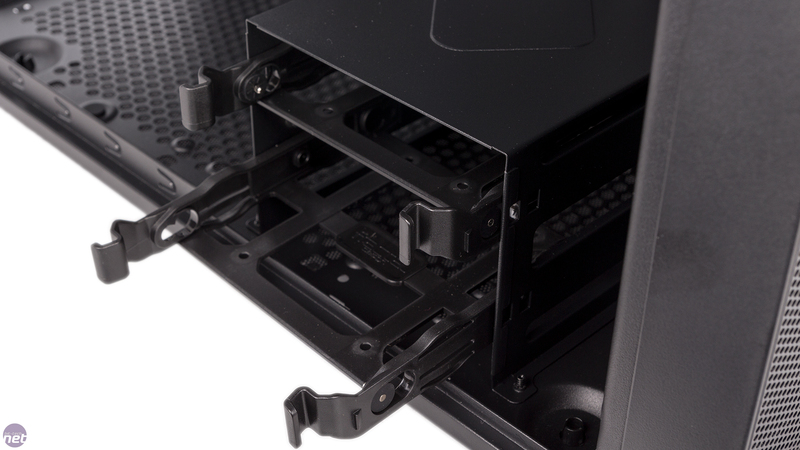 The lower HDD cage is removable, but it can't be moved anywhere without modification, so you'll be left with just a single, difficult-to-access 2.5” mount if you go this route. The ODD cage, meanwhile, is not removable.